Tags: 2019 WSOP, Jeremy Hilsercop, Joey Ingram. Posted on Thursday, December 27, 2018 by "T". Jeremy Hilsercop, an industrious family man who works at Wood Group in Nashville as a General Superintendent, received an awesome gift from his thoughtful wife Randi that involved a trip to his first-ever WSOP on Christmas morning: plane tickets to Las Vegas, hotel accommodations at the Rio, and a ticket to play in an event of the World Series of Poker. For any serious or even for a recreational poker player, this present definitely beats other usual holiday gifts like clothes, shoes, toys or video games that most people usually receive. If you thought that was the end of that, you'd say to Jeremy, "Good for him, he's got a wonderful Christmas gift." However, when Randi posted the video on social media, the poker community responded with even more enthusiasm and generosity to help give Jeremy the ultimate, first-time WSOP experience. First off, WSOP sent a personal message to Jeremy, welcoming him to their upcoming golden summer event. Many other companies immediately proposed offers for poker training products and poker coaching. 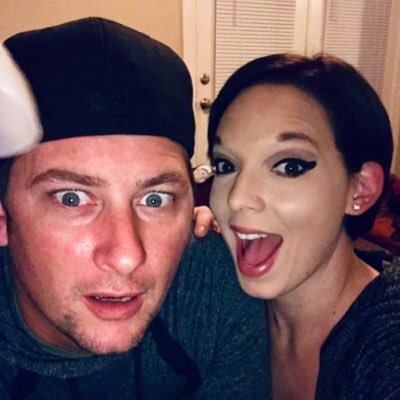 There were some players who even asked to buy some of Jeremy's action, which could potentially help extend his summer trip with a few more tournaments. 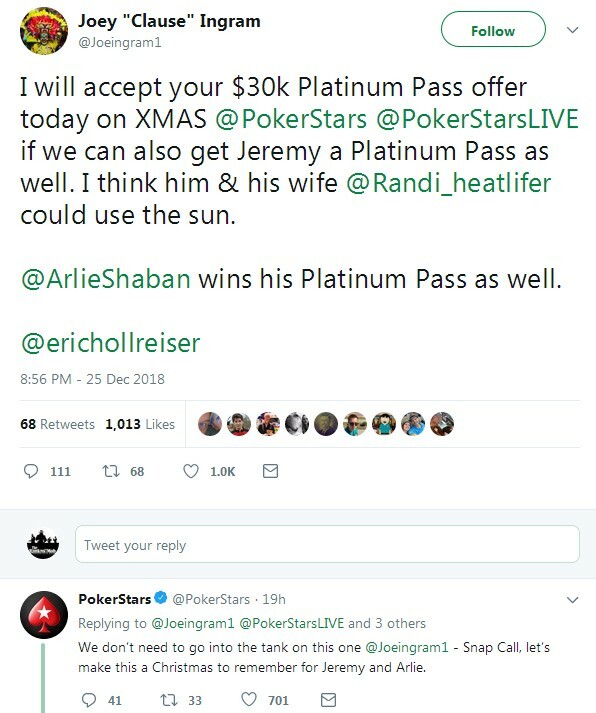 That's not all, Joey Ingram made Jeremy's Christmas gift even better, calling out to PokerStars to give the first-timer a Platinum Pass, to which the giant poker company responded, "let's make this a Christmas to remember for Jeremy." Thanks to the Platinum Pass, Hilsercop shall go to the Bahamas in January with $2,000 in travel expenses plus 6 nights' stay at Atlantis Resort, Nassau, in The Bahamas and $25,000 worth of entry tickets into the $8 million guaranteed inaugural PokerStars Players Championship at the yearly PCA. Randi said her husband has been playing poker "since he was 12 but has never really had the chance to play in any big games or tournaments. He's been able to play in smaller cash games, mostly 1/2 and 2/5 making some pretty decent gains but his family always comes first. Every time we have some spare time and a babysitter, I will say ‘let's go,' and we are off to the nearest casino." 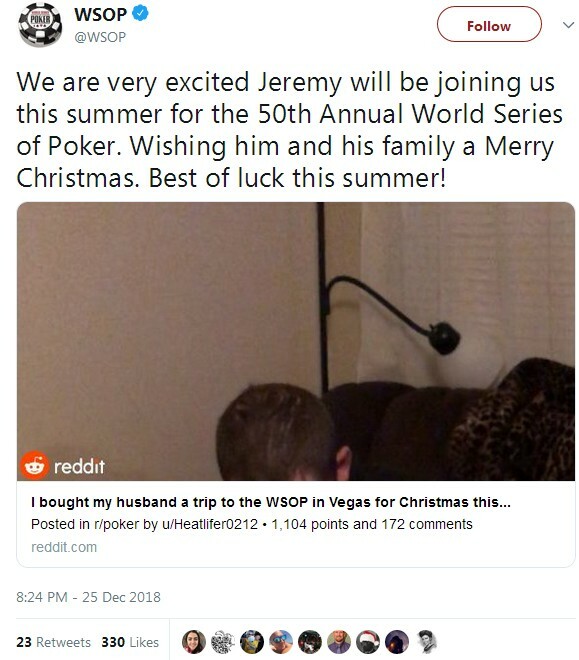 11 comments for "Wife Gives Husband an Unforgettable Christmas Gift - a Trip to the 2019 WSOP"
This woman made a special gift for her husband. His wife noticed that her husband likes poker and she acted in this way. This is proof of love and this woman did not want to give the husband a banal thing. On this occasion, both will visit Las Vegas and that's a nice thing. Whoever thought something so wonderful could leave you crying buckets - I wasn't the recipient and I am surrounded by a salty ocean. That was a good gift for er husband. He is going to have a great experience by playing in WSOP. And not only that, but he also got that platinum pass, and he will play in bahamas next year two. this is something special and now you can see what one gesture can do to people and especially when is something like this which is not cheap!she know what he love and this he will remember till end of life!now its up to him what he will do for her next year!great job wife! and havent managed to buy or win a icket for such an event. now what a story this would be if he come to prize pool or something even more to win!to come with wifes present on such a big tournament and with few lucky cards to come in chance to win nice amount would be hell of story!wish him lot of luck in few months!